I’ve learned a lot throughout my lifetime. As a kid, I learned that mixing cocoa powder into milk does NOT make chocolate milk. As a teenager, I learned that there were multiple different types of chocolate- aka I discovered dark chocolate. Yay! As an adult, I learned that it’s easy to scorch chocolate when melting it. 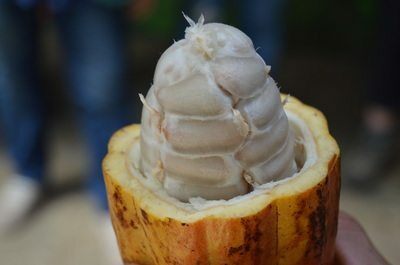 I also learned about cacao. (nope, not a misspelling). High-quality and the correct ingredients are the difference between a delicious recipe and a…well, disaster. Understanding the differences between ingredients is important (as when I was a kid trying to make chocolate milk). Today, as part of ongoing series “Baking 101” I’m going to explore the wonderful world of cacao, cocoa, and chocolate products. 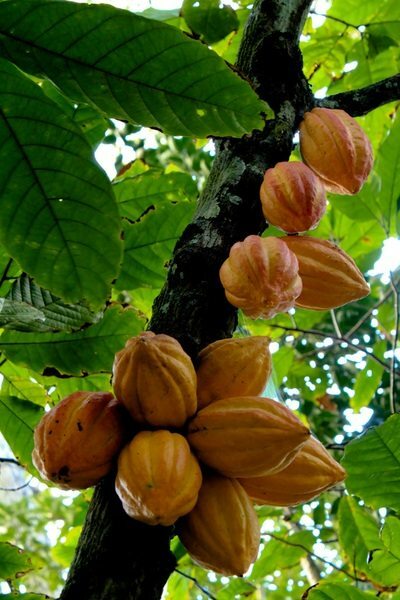 The source of what we normally think of as “chocolate” is actually the fruit of a tree: a cacao tree to be exact. We pronounce that ka-KOW, apparently. Farmers hack off the ripe cacao pods. Then they open the pods by hand (we don’t want to damage the 30-40 seeds that are in each pod). These seeds are what we call “beans”. Yep, those white things below are actually raw cacao beans. They pull out the beans. The beans and pulp are placed in big wooden containers and allowed to ferment. This step is really important. It also looks really nasty. I found a picture, but decided to save you from having to see it. Depending upon the bean type, it takes between a few days and a week or so for the fermentation process. After fermentation, the beans are spread out to dry in the sun. Good chocolate is allowed to dry naturally. Cheap, nasty chocolate may be hurried along by drying the beans over a fire. Here’s where it gets a little more complicated. You can take dried cacao beans (before they’re roasted), and cold-press them. You end up with raw cacao powder, which looks a lot like cocoa powder. I have never, ever ran across a recipe that called for cacao…but apparently it’s a health food trend. But…back to the rest of us. The cacao beans are roasted. There are a multitude of ways, and its up to the chocolate manufacturer. After roasting, the cacao beans are cracked and separated. The thin shell around the inside is used for multiple things: compost mulch or flavoring for beer, wine, or coffee. Experiments continue. The pure little bit of “meat” in the middle is called a cacao nib. These nibs are what makes all of the chocolate products we use. The nibs are ground into a thick paste: chocolate liquor (no, there is no alcohol in this liquor…unfortunately…that might taste good!). This paste includes the cocoa solids (the chocolaty part) & the cocoa butter (the natural fat in the “bean”). 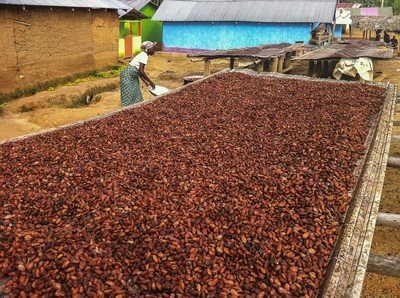 From here, we enter the world of cocoa products as we use them. The source of the delicious substance called "chocolate." Cacao beans still in the pod. Baker’s chocolate (aka: unsweetened chocolate, bitter chocolate, pure chocolate): as the name says, pure chocolate, no sugar added. Candy melts (aka: decorator’s chocolate, chocolate melts, confectioners’ chocolate)- inexpensive chocolate used for dipping and molding. This is one time you buy chocolate that is made with vegetable oil instead of cocoa butter. It’s slightly more forgiving than “regular” chocolate about melting temperatures. It also has a slightly higher melting point so you can work with it in your hands for small time periods without it melting completely. Chocolate & chocolate chips, bittersweet: sweetened chocolate heavy with cocoa butter and lighter in sugar; has rich, intense flavor. Usually at least 50% cocoa butter. Note that chips may contain slightly less butter so they maintain shape when cooked. Chocolate & chocolate chips, dark: Can actually refer to any chocolate other than milk or white. Including bittersweet and semi-sweet. Note that chips may contain slightly less butter so they maintain shape when cooked. Chocolate & chocolate chips, milk: what most people think of when they think of a “plain, chocolate candy bar”. Despite sweeter taste lacking the deep cocoa flavor, used by many cooks in cookies, muffins, etc. Note that chips may contain slightly less butter so they maintain shape when cooked. Chocolate & chocolate chips, semi-sweet: Between milk chocolate and bittersweet chocolate on scale of “sugary/less chocolate flavor to bitter/deeper chocolate flavor.” Note that chips may contain slightly less butter so they maintain shape when cooked. Cocoa butter: cream-colored, sold in “chunks.” Melts easily in the hand. Extracted from the paste above by hydraulic press. Extra cocoa butter is added to chocolate to give it a smooth, glossy texture/look. Also added to chocolate to thin it to allow for pouring a thinner coating on something (such as a cake). (Some manufacturers use vegetable fats…do NOT buy these). It is also used in cosmetics and medicine. Cocoa powder: dry, brown colored powder. Extracted from the paste above by hydraulic press (other byproduct is cocoa butter). Basically, the chocolate “bean” with the fat removed. Naturally slightly acidic. (Will react with leavening agents such as baking soda). Similar to unsweetened chocolate, but as a powder and with less cocoa butter. Cocoa powder (Dutch processed, aka: European style, alkalized, Dutched): regular cocoa powder that has been “alkalized” to bring the acid to a neutral. 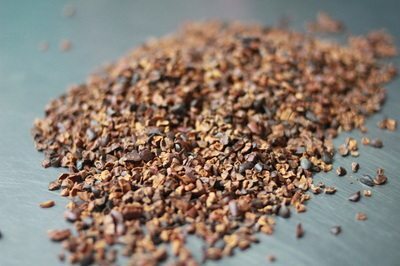 Richer, but smooth/more mild flavor (less bitter) than regular cocoa powder. (Will not react with leavening agents such as baking soda; recipes usually need baking powder). Hot cocoa mix: despite being a powder, not interchangeable at all with cocoa powder. Combination of sugars, cocoa powder, and dry milk/creamer. Requires adding only hot water to make hot cocoa. Mexican chocolate (aka Mexican-style sweet chocolate): grainy chocolate flavored with cinnamon, sugar, and almonds. Used for hot cocoa and mole sauce(?). Sweet chocolate (aka: sweet dark chocolate, sweet baking chocolate): Similar to semi-sweet, but with more sugar. Understanding Leavening Agents: Yeast, Baking Powder, Baking Soda, etc. You’re welcome. Hope you found it useful.